We all know the importance of eliminating bacteria, mold and fungi. Hospitals, sports arenas, day cares and airports spend thousands of dollars trying to keep germs, and the infections they cause, at bay. With the cost of treating illnesses caused by bacterial infections on the rise, reducing the germs that cause them has become a top priority. It’s clear that our current procedures, including the intermittent use of chemical sprays and wipes, aren’t enough. We need additional tools. And that’s where the continuous disinfecting power of Vital Vio can be put to work. Vital Vio’s White Light Disinfection™ Technology emits a safe, true white light, that dramatically reduces contamination and infection risk with the flip of switch. Vital Vio’s disinfecting technology emits a spectrum of light that damages multiple cell structures within microorganisms. This results in the death of the bacterial cell, without causing any harm to the people, pets and plants in the room. This light touches the surfaces of a room – the same ones we do, — providing us with illumination, while working to dramatically reduce and kill illness causing bacteria. Unlike harmful UV light, Vital Vio’s Viosafe® Technology harnesses light in the 400-405nm range which is safe for multi-cellular organisms. The International Electrotechnical Commission – the international standards organization that prepares and publishes International Standards for all electrical, electronic and related technologies – has certified, as administered by Underwriter’s Laboratory (UL), that products Powered by Vital Vio are safe for continuous exposure and unrestricted use. And because it’s as easy as flipping a switch, using Vital Vio’s White Light Disinfection® Technology doesn’t interrupt the daily activities of a space. No longer do hospitals have to wait for routine cleaning times, or restaurants have to wait for patrons to leave, to begin disinfecting the space. The continuous nature of these lights also removes the human error in cleaning and disinfecting, ensuring safe and effective disinfection around the clock. Since the announcement of our collaboration with Vital Vio in September 2018, we have fielded some questions about the safety and the science behind Vital Vio’s White Light Disinfection™ Technology. 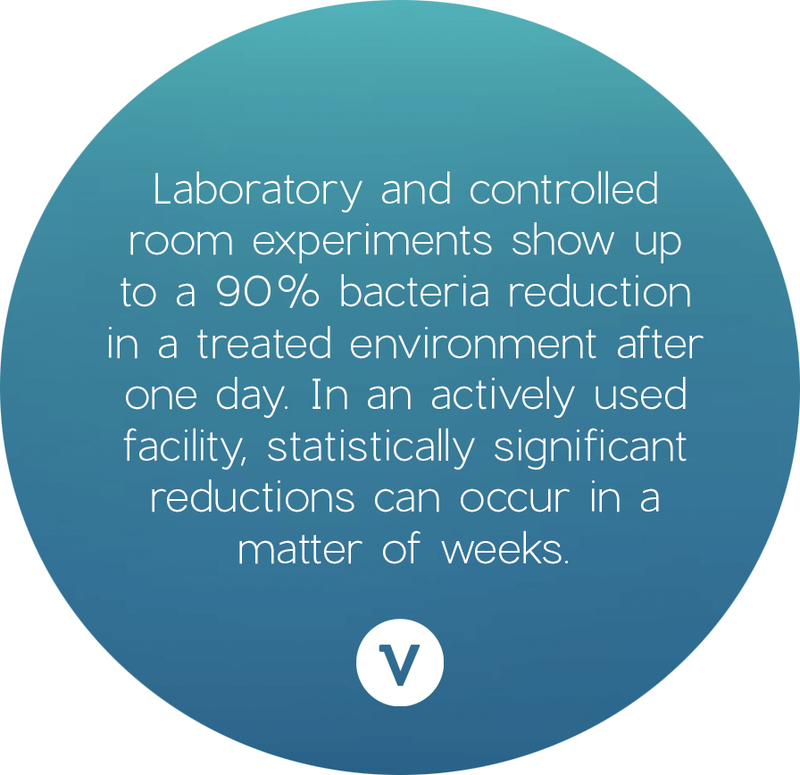 Vital Vio has provided us with a new white paper, written by their experts, that helps to explain this new disinfection method. The science behind this technology and how its application is harmful to bacteria, mold, and fungi, but completely safe for pets, humans, and plants, is explained. Innovation: Working With You To Create a Build-2-Spec luminaire that will be attractive while also saving energy and delivering the disinfecting power of Vital Vio. Integration: Modifying Standard Products to meet the requirements of the specific Vital Vio application or aesthetic preferences. Inspiration: A preferred color scheme or consistent branding in a particular space can be achieved in businesses wishing to utilize Vital Vio. PMC’s Build-2-Spec focus means that you will receive a precisely engineered luminaire that meets your space needs. In an existing structure, this means a space where a standard fixture will not fit can have the protection and benefit of infection control. It will allow customization of space. In a new structure or renovated building, you will not sacrifice design and style for the utility of infection reduction by Vital Vio. This Build-2-Spec ability to customize by PMC Lighting proves a natural fit for those looking to combine form and function. pūr-led™ luminaries will join clean, modern, and stylish looks with Vital Vio’s patented VioSafe® White Light Disinfection® technology. Whether you have a unique space that needs a Build-2-Spec fixture, or you have a more standard space that one of our ready-to-install fixture options will work in, you will achieve the perfect blend of design form and disinfecting function for any room or structure. Vital Vio is the leader in clinical research for visible light disinfection. Want proof? You can request detailed case studies and results from internal and independent research. While using light to disinfect is not a new practice, using Vital Vio’s disinfecting light technology is. The most commonly recognized way of using light to disinfect is Ultra Violet (UV) light. Unfortunately, the UV wavelength of 250 nm damages DNA, and is harmful to human skin and eyes. Vital Vio’s White Light Disinfecting® Light emits light at a 400-405 nm wavelength that kills single cell organisms (like bacteria) but causes no harm to multicellular ones (like humans). Vital Vio’s technology has been tested safe for continuous use around people, pets and plants. Do these lights also kill naturally occurring, healthy bacteria on humans? A majority of good bacteria lives inside your gut – which is unaffected by outside light. Any good bacteria on your skin usually lives one or two layers down, and is often covered by clothing. Any good bacteria on your skin killed by disinfecting light is minimal, and those that are would naturally repopulate over time. What bacteria can light fixtures powered by Vital Vio kill? Vital Vio’s lighting technology has been proven effective in killing gram negative and gram positive bacteria, bacterial endospores, yeast, mold and fungi. Please inquire with PMC for a full list and specific research and case studies testing the germs of most concern to you. What areas can be disinfected by lights powered by Vital Vio? Vital Vio’s White Light Disinfecting® Light works by dramatically reducing bacteria on any surface it touches. Any place your eyes can see illuminated is being disinfected by Vital Vio technology. What about when the lights are off? The longer Vital Vio’s White Light Disinfecting® Light is on, the better it works. When a room is not in use, lights powered by Vital Vio have the option to be turned to “Eco Mode” which kills with 2X the disinfection dosage, but is still safe for people and pets. Will these lights fit within my current structure, or design plan? With PMC Lighting’s Build-2-Spec ability to customize lighting, we can create a fixture that will fit any existing space or design style. Now you can take advantage of Vital Vio’s White Light Disinfecting® Light Technology, without sacrificing design or space. Have more questions about Vital Vio’s White Light Disinfection® Technology or about PMC Lighting’s Build-2-Spec Lighting? Click the button below to find your local lighting agent who would be more than happy to get you all the information you need.